What is Xarelto (Rivaroxaban) used for? 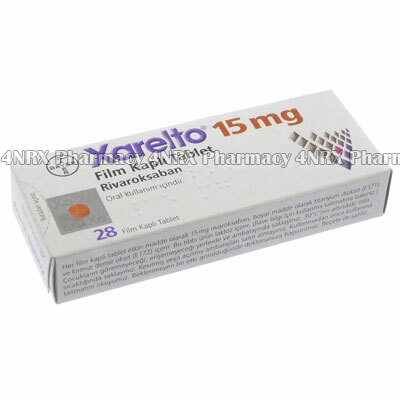 Xarelto (Rivaroxaban) is an oral anticoagulant medication used to prevent deep vein thrombosis, strokes, or potential heart attacks in patients with acute coronary syndrome. It functions by preventing the actions of platelets in the blood which normally bond together to form blood clots. This thins the blood allowing easier blood flow and preventing the formation of clots that may block veins or major arteries that can lead to strokes or heart attacks. Your doctor may prescribe this medication along with others or for the treatment of other unlisted conditions. How should I use Xarelto (Rivaroxaban)? Xarelto (Rivaroxaban) is normally administered once daily at a dosage of one tablet, but your individual directions will be determined by your doctor based on your age, weight, current health, the condition being treated, and the severity of your symptoms. These should be swallowed with a large glass of water and may be taken with or without food, although a snack or meal is recommended before use if you get an upset stomach. Do not split, chew, or crush the tablets before taking them as this may destroy or alter the effects of their contents. Ask your doctor any questions you have about using the medicine to ensure the correct administration. What are the side effects of Xarelto (Rivaroxaban)? Serious side effects that may require immediate medical attention include headaches, dizziness, faintness, sensitive skin, easier bruising, red or pink urine, bloody or darkened stools, or vomiting a substance resembling coffee grounds. Inform your doctor immediately if any unusual symptoms occur to make sure the proper alterations are made to your dosage or frequency of administration to prevent further complications from occurring. Xarelto (Rivaroxaban) should not be used by patients who are pregnant, breastfeeding, lactose intolerant, under the age of eighteen, or who are having hip surgery, who have an artificial heart valve, active bleeding, a disorder causing excess bleeding, a brain injury, spinal injury, liver disease associated with clotting issues, severe liver cirrhosis, or who are taking other medications that prevent blood clots. It is also important to inform your doctor if you have untreated hypertension, low platelet counts, an increased tendency to bleed, mild liver cirrhosis if you are coughing up blood, reduced kidney function, or taking other medications that may increase the risk of bleeding. These conditions may cause unexpected health problems requiring alterations to your regimen. Strictly use Xarelto (Rivaroxaban) as prescribed and follow all instructions provided by your doctor. Safe, suitable, and optimum dosage can vary and is dependent on the patient`s health and medical history, as well as the condition you are treating. Xarelto (Rivaroxaban) may not be safe or suitable for all patients. Always ensure your doctor is informed if you are pregnant or breastfeeding, using any other type of medication (including non-prescription medicine, vitamins, and supplements), as well as if you have any allergies, other illnesses, or pre-existing medication conditions.